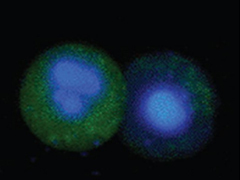 Apoptotic cells stained with FAM FLICA™ Caspase Kit (green) & nuclear counterstain (blue). The left cell shows higher caspase activity compared to the right cell. Apoptosis, a form of programed cell death, is directed by activated caspases. Caspases are cysteine proteases that can cleave other proteins, and upon activation, create a positive-feedback cascade, which ensures the cell will undergo apoptosis. Our Caspase FLICA™ Apoptosis Detection Kits allow analysis of active caspases in whole, living cells. Their methodology is based on a unique cell-permeable and non-cytotoxic reagent called the Fluorochrome Inhibitor of Caspases (FLICA). The reagent contains a caspase inhibitor sequence (such as VAD) linked to a green (carboxyfluorescein, FAM) or red (sulforhodamine, SR) fluorescent probe. FLICA™ passes through an intact plasma membrane and covalently binds to the active caspase. Any unbound FLICA™ diffuses out of the cell and is washed away. As FLICA™ only binds to the active caspase, there is no interference from pro-caspases or inactive forms of the enzyme. The remaining fluorescent signal gives a direct measure of the amount of active caspase in the whole living cell. Cellular analysis may be performed with a fluorescence microscope, plate reader or flow cytometer. Results (see Figure) using Poly Caspase FLICA™ Kits (Product Code ICT091& ICT092) analyzed by fluorescence microscopy show suspension cells labeled with FAM-VAD-FMK, and Hoechst 33342 stain. Both cells are apoptotic and dying - detected by (green) caspase activity and (blue) nuclear Hoechst staining. The left cell is much brighter green than the right cell, indicating that the left cell has more active caspases. Caspase FLICA™ Kits are suitable for cells in suspension, adherent cells, thin tissue sections, and thin frozen sections (but not fixed or paraffin-embedded tissues) from many species including mammals, insects and yeast. Different cell types e.g. HeLa, primary neurons, macrophages and lymphocytes have been successfully studied with these kits. 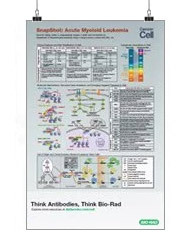 Bio-Rad offers four types of Caspase FLICA™ Kit; FAM FLICA that fluoresces at 525 nm (green), SR FLICA which fluoresces at 590 nm (red), Magic Red FLICA which fluoresces at 628 nm (red) and FLICA 660 which fluoresces at 690 nm (far red). SR FLICA and FLICA 660 are useful for studying caspase activity in GFP-transfected cell lines and for multi-color experiments with other green reagents. For general apoptosis detection, Poly Caspase Kits are recommended, as they will react with all active caspases. Alternatively, individual caspase activity may be studied with the single caspase FLICA Kits (see Table below). NOTE: All these kits may also be used with fluorescence plate readers.